If you’re on Facebook or Pinterest, please use the buttons above, thank you! I’m going to be bringing you a recipe that isn’t a sweet soon, but I wanted to have this delicious recipe to you before Valentine’s day in case you’d like to make it for your sweetie’s breakfast. Assemble everything the night before and then just pop it in the oven in the morning and breakfast is served! Before I go into the recipe you know I have to chat though! Yesterday evening while I was making supper I got a phone call from my friend, Tim (or Teeeyuhm as is the proper Slabama pronunciation). Tim and I have known each other for several years and lately we’ve been working on our first project together, a Southern lifestyle radio show that we’ll be distributing through several channels (including the internet, so anyone reading this will be able to download it and listen free). I’ve spoke about it briefly on the Front Porch and got some great input from y’all there! We filmed our first few shows two weeks ago but then never put them out there once we got them produced because – dun Dun DUN! Some friends of ours who are Dj’s listened to them and liked us (there’s just no accounting for taste these days ya know) and invited us to come record our show live in their studio. Out of this we’ve also managed to get advertisers and a producer, which is pretty dern cool for not having a single show air yet! So that is where I’ll be this Saturday morning, recording and likely feeding people in a radio studio. This time around you should hear the final product hopefully within a week. So Tim was acting as a go between to set up a time that we would be there to record. I asked him if we could do it in the morning since that is a special day for me and I wanted to spend the bigger part of it with the kids. I laughed at him. You know, because I’m just that kind of friend. It’s not that I want to one up everyone else with my wakeup time or that I really and truly have to start work at 4:00 AM. The truth of the matter is I’m a major construction project so I’ve got to get to work early. No, I don’t mean makeup and hair, although that takes a good bit of work as well. I mean Me, as a person, myself, I’m under some serious construction. In order to be a better person, to live up to whatever meager potential that has been placed within me – I’ve got some serious work to do so I gotta get going on it early. Being a positive person? That takes work. Making sure I have a filter in place so I don’t say everything I want to say? That takes some serious work (and sometimes i have to sit on my hands so they won’t type!). Having my head in the right place so I don’t even think ugly things to begin with? Better make sure we have a full crew present on site each day by 5:00 am at the latest. Loving others? Okay, that comes easy. It’s so very easy to love other people and I’ll admit that part comes naturally for me. But being the kind of person I was meant to be? Disciplining myself on a day to day basis to fill the shoes that were placed before me? – that takes some work. So I gotta start early. 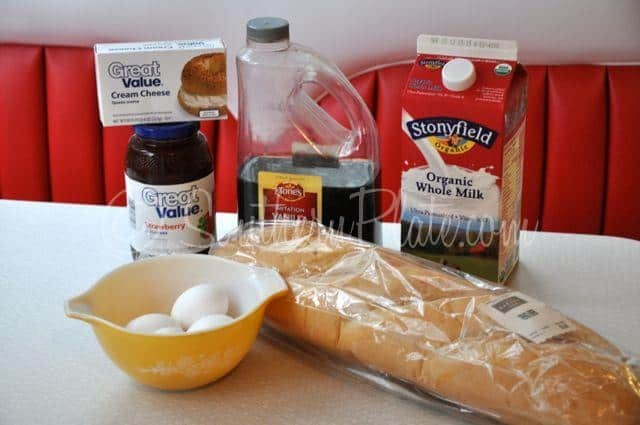 You’ll need: Eggs, Strawberry Preserves*, Cream Cheese, Vanilla (not the gallon I have pictured here, just a little bit will do), Milk, and a loaf of French Bread. *If you aren’t crazy about strawberry preserves just get your favorite, but this sho nuff is some good stuff with the strawberry in there! 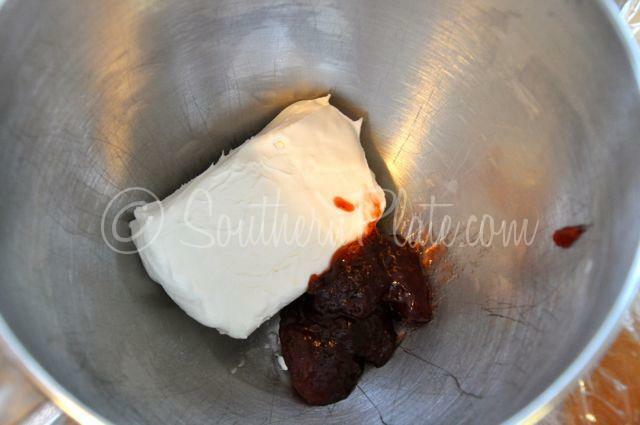 Make sure your cream cheese is good and soft and place it in a mixing bowl with about 3 Tablespoons of preserves. Mix that up with your electric mixer until good and blended. 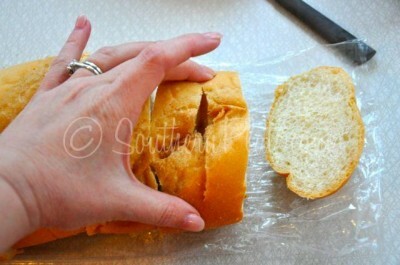 Now take your loaf of bread and cut some big old honking slices out of it. We want our slices to be anywhere from an inch and a half to two inches thick. Using a knife, cut a little pocket into each one, making sure you don’t cut all the way through to the bottom or all the way through to the sides. 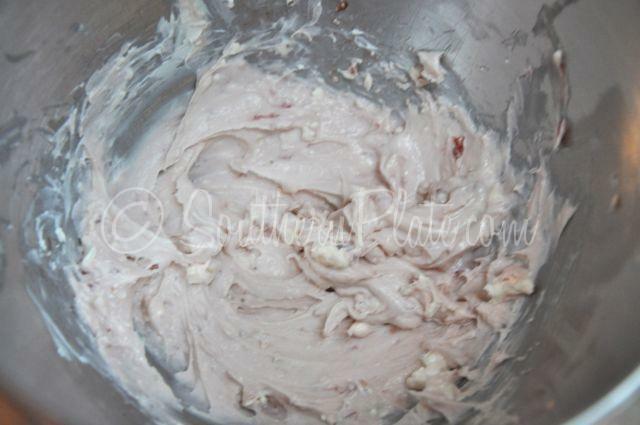 We just want a little pocket in the very center that we can stuff our cream cheese mixture into. Oh, by the way, you can totally use fat fee or low fat cream cheese or that other thing folks use in place of cream cheese called neufetchel or something like that. Here are our slices all stuffed and ready to go. This is a deeper than normal baking dish but you can use a regular one if you like, it will be just fine. Place them all on their sides in the baking dish. Mix your other ingredients really well. I just use a fork to do this with.. 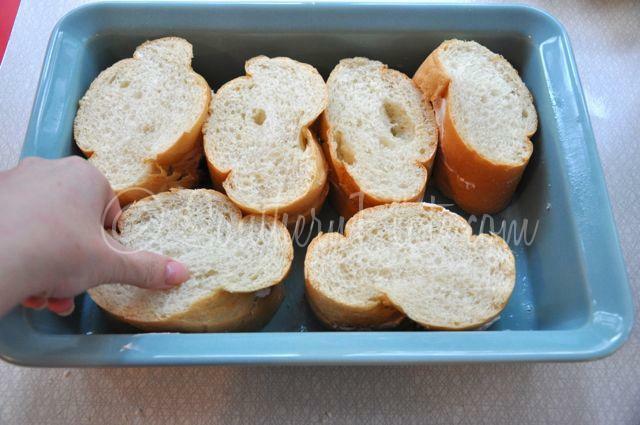 Slowly pour liquid over bread slices. I pour a little over the top of each one until I run out. Sometimes I make this as a special treat as part of our supper and then I just assemble in the morning and let sit in the fridge, covered, all day. When ready to bake, remove cover and bake at 350 for 30-40 minutes, or until golden. Here she is, in her rhinestone tiara. We had just got back from going out shopping together and she wore the tiara the entire time. I asked her, before leaving, if she thought she should take it off or wear it and she said “Oh Mama, it’s just the same thing as a headband, only sparklier!”. I’ll be danged if that isn’t a smart kid! And here is the lovely final photograph she helped arrange! To prepare your strawberry syrup, simply take some strawberry preserves and place them in a microwave safe cup or small pitcher and follow the instructions in the recipe below. This makes a delicious and super easy syrup! 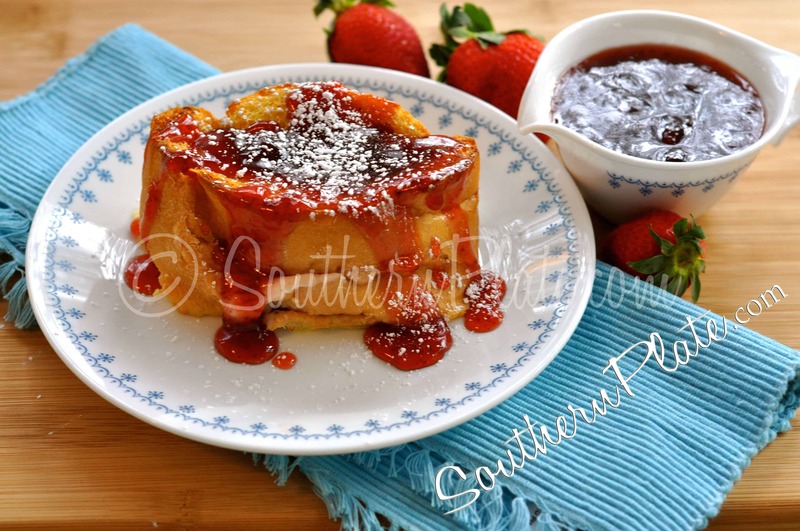 MAKE THIS SUGAR FREE – simply by using sugar free preserves! Place softened cream cheese and 3 tablespoons preserves in mixing bowl and beat with an electric mixer until well combined and creamy. Set aside. Cut french bread into six 1½ inch to 2 inch slices. Reserve end pieces for another use. 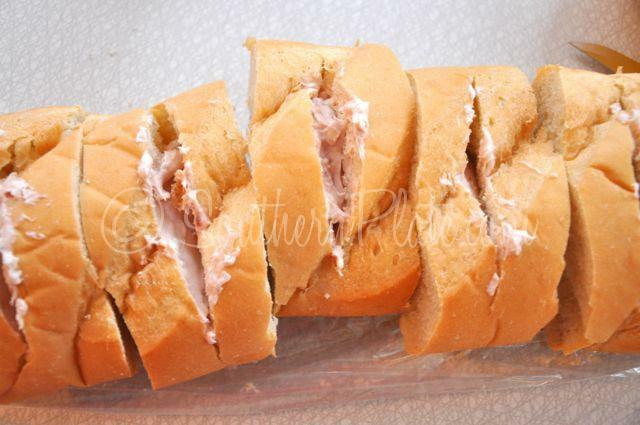 Cut a pocket into the side of each slice, being careful not to go all the way to the bottom. 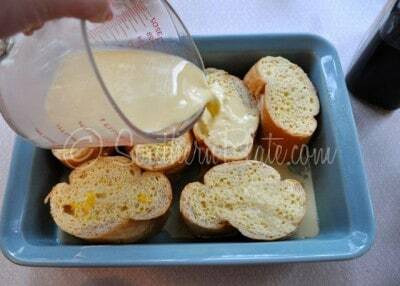 Stuff each pocket with cream cheese mixture. Spray 9 x 13 dish with cooking spray. Arrange slices flat in dish. 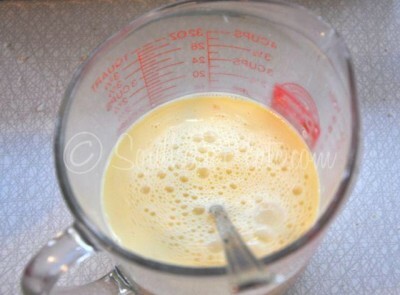 In bowl beat together eggs, milk, and vanilla until well blended. 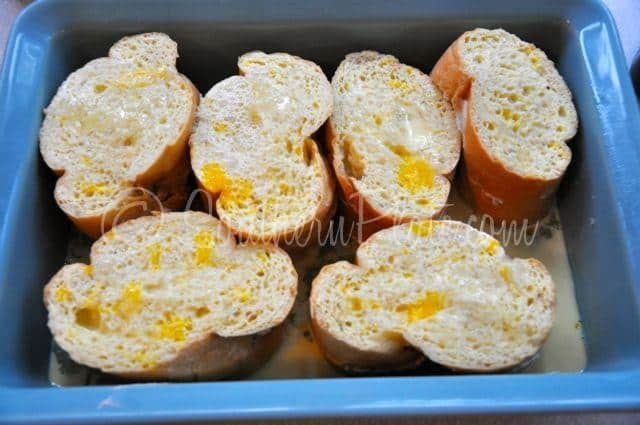 Pour over tops of bread in baking dish. Cover and refrigerate several hours or overnight. 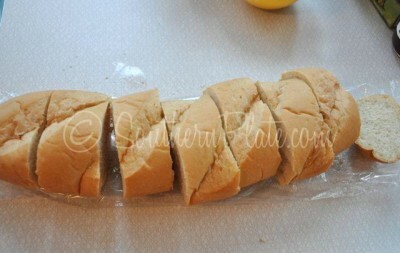 Remove cover and bake in a 350 degree oven for 30-40 minutes, or until golden brown. Place 1 cup strawberry preserves in a microwave safe bowl. Microwave at 30 second intervals, stirring in between each, until melted and pourable consistency. Serve warm over warm stuffed french toast. MAKE THIS SUGAR FREE - by using sugar free preserves! I can’t tell you how much I enjoyed reading your comments in the post my mother wrote yesterday. 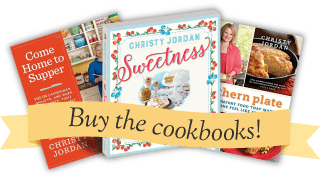 I dearly love any time I get to hear from you but I especially enjoy the comments here on Southern Plate because I get to save them here and I have a much better chance of getting to write back to you. Are you a construction project, too? Do you think you’re going to make this french toast soon? What is the best part of each morning for you? I’d love for you to answer any of these questions or just drop a “Hidy” in the comments below! Valentine’s Cupcake Toppers (video) – This has my kids in it and wow, they’ve grown so much since then! Mama’s Milk Dunkin’ M&M Cookies for Valentine’s Day – A childhood favorite, use those Christmas M&M’s! A Native American tale told many times around the Sacred Fire. 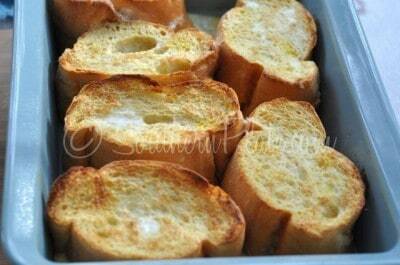 The French toast looks good and the photos are fantastic. And I would wear a tiara all day everyday too! You and Katy Rose have sooooooo much in common! Oh this looks so delicious! I will be trying this very soon. 🙂 I can’t say I get up as early as you do Christy but I work in customer service. People call me when they are frustrated or angry much of the time. It’s imperative that I’m up and getting my attitude adjusted to deal with these calls without taking them personally, because it’s really not personal. It’s still hard to take the abuse if I have not finished my coffee. It takes a special kind of person to do what you do, Jessi! I understand fully what you mean and how hard it is. I get me some nasties every now and then and it sometimes takes a lot to see through it and love the person on the other end! lol I hope you have a wonderful day today and please know that your kindness changes people you’ll never know!!! Oh Christy girl, I gotta try this. Where did you get KR’s tiara? I would like to get a hold of a few. Cooking 101 question. 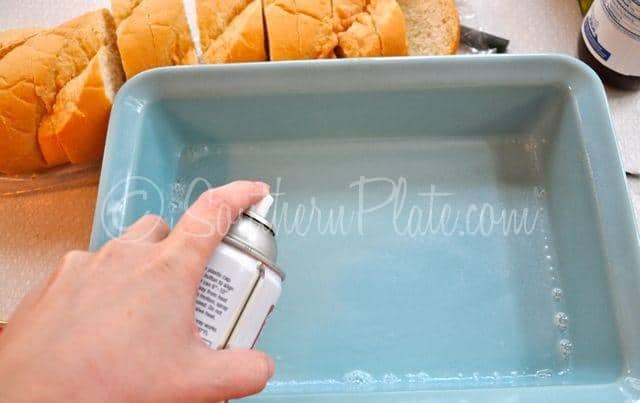 Is it ok to pull a pan out of the fridge and put it straight in the oven or do you need to let it sit out for awhile? It really depends on your pan. Metal pan, go for it. I set my pan on the counter while I preheat and put it right in but your thoughts of letting it sit out a bit is always a safe bet. You can also put your pan in the oven and let them preheat together. If you’re using a newer USA made Pyrex glass pan I’d definitely let it come to room temp. Good question!! 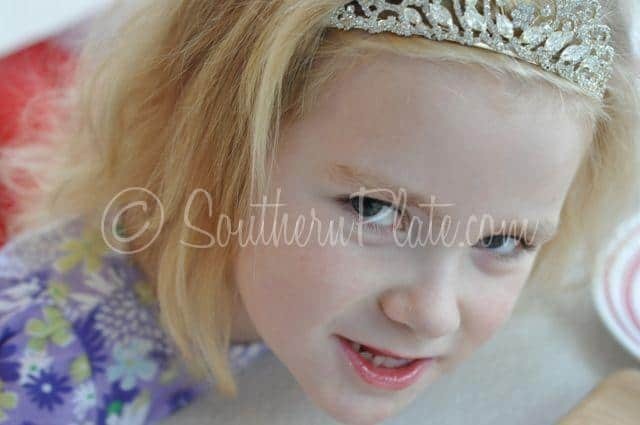 I love your daughter’s response about the tiara. Good for her–she likes being a girlie-girl. Now that I’m old, I, too, just want to have pretty things around me. Sparkly things work! She and i would dance around with our tiaras, especially after looking after those French toasts! Total yummy! Can’t wait to give this one a try! This looks delicious! I used to be a morning person back when I was younger. Mom would take us to our grandma’s house around 6 in the morning, I guess it was the fresh country air mixed with the dew on the grass that just woke me up! Someone needs to make a candle of that so I can smell it every morning. Thanks for today’s inspirational message. I’m SO not a morning person (I was even born in the afternoon! -grins-), but I do see the advantages of getting that kind of jump start on the day! Early bird getting the worm, huh….thought I would never been able to sleep past 4 am – my “get up” time before I retired, but thankfully 6 am is now my early bird time. House is quiet, my “me time”, computer time, anything I want to do time – love, love, love it. Didn’t like to cook much back then, but you have put some joy back in that for me and believe me, my spouse appreciates it !!!!!!!!!!!!!!!!!!!! I’m a natural night owl, but I have to get up and get my daughter to school, so I wake up at 5:45 during the week. My best days are when I take my chocolate lab (Butch) to our giant dog park right after I drop off my daughter. It’s a great way to start the day…with a bunch of happy dogs. I’ve never made french toast in the oven before. Sounds like a fun pot-luck item for church. I’m sure everyone would love it. I think that “under construction” is the way we all should feel. I have a problem with patience and am constantly battling to keep my pie hole shut. Can you use the flavored whipped cream cheese with the same results? Keep on with what you’re doin’ Christy — you’re a bright spot in the day! How ADORABLE is that sparkly princess! From one lark to another Christy, I love this blog post. You captured it perfectly. I have 4 children and I need prep time to be ready for them. Oh, and I need hair and makeup too. Lol. I can’t wait to try this recipe. I wonder how it will be with a whole grain bread? My kids are brainwashed that all bread is whole wheat! Christy, I am also a MAJOR construction project!! Or a work in progress, is kinda my way of saying it.. Even at my age (57, almost 58).. I still don’t have it together…. I am hoping this year will be a year to really work on my “stuff” and get myself on the track of health and renewal… You are such a cutie and love your writing style.. I feel I could sit and talk with you for hours. I am a Yankee, but also half Southern.. mom from Little Rock, dad from Illinois… but was brought up with those southern values and also lived in Kentucky for a few years.. so much of what you write brings back great memories! Keep up the good work.. oh, I am a definite Night Owl living in an early morning world!! I don’t think that will change but I am much better at just getting on with it than I used to be!! 🙂 Keep up the great work!!! YUM! This recipe could make anyone feel like a princess. I say we all wear sparkly tiaras while making & serving this! Have out of town family coming this weekend can’t wait to try this recipe. LOOKS YUMMY !!! Pinned! I know my hubby will like it. I’m hoping my two year old (who wants a tiara, but keeps breaking them) will eat it. Thanks for another awesome recipe!!! People ask me “why do you get up so early?” You must be a morning person……NO!! I am a construction project as well!! I am a 5:30 a.m. person. Loved your mama’s post and yours too. and the recipe looks yummy! “Early to bed and early to rise, makes a man healthy, wealthy & wise.” My mom taught me that. Don’t know about the wealthy part though! The recipe looks fantastic, thanks! What a wonderful “helper” you have!!!!! LOVE your construction dialog! I’m sure nearly all of us agree even if we don’t itemize it as such. After reading I was ready to invite you over for tea or coffee. Being a card-carrying memer of the DAR from NY you might not even come. I know so little about the south except for the fact that my sons who are NASCAR engineers live in Charlotte that I yearn to learn. Two new DIL, also from the south, are helping me learn the traditions as well as cooking. Yes, I can make a mean pate au choux but have never fried a chicken and don’t eat stuf with my hands that gets in my teeth and all over my face. That being said, I’ve loved your blog since I discovered it. Every recipe turns out great. My hubby says it’s like his second childhood, lol, so much for Mr. meat and ‘taters. Thanks for your insight, humor, recipes, and opening your life to us. I can think of no greater honor than being invited to your house! I’m actually eligible to join the DAR through my ancestor, Presley Thorn! We’d gab all day into the night!! I just made this for Sunday dinner! I used fat free cream cheese, Egg Beaters instead of eggs, reduced calorie maple syrup in with the eggs and once it was baked, I put sliced strawberries on the side and offered more syrup for those who wanted it. It was a hit!